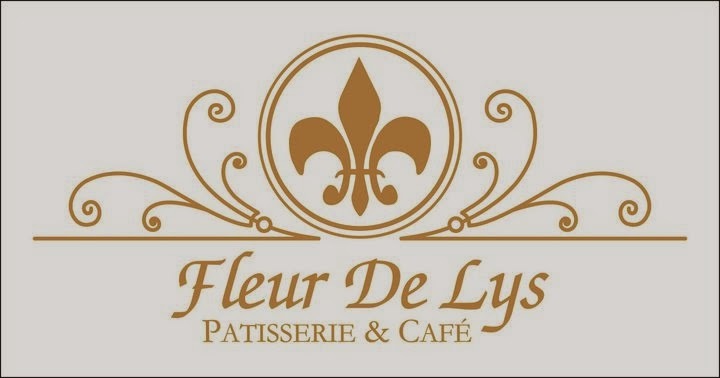 For those who dedicate an extra-large portion of their blog to the insatiable appetite for discovering newly opened restaurants and cafe, it's proverbial that we still have an all-consuming penchant for dessert-lovers' all-time favorites from Fleur De Lys Patisserie. This pastry shop have been there since 2006 (referenced from Lori's DCF blog). And I'm thinking why haven't I read or heard about it long before. After attending a restaurant review with fellow bloggers at Timog Ave., I made it a point to make a short walk to Tomas Morato, to stop by and comb my fork over the known cafe to sample some of their pastry offerings. What actually made me hover over the internet to search for Fleur De Lys is their Florentines, which was given to us during the WOFEX 2013 media dinner at Azuthai. 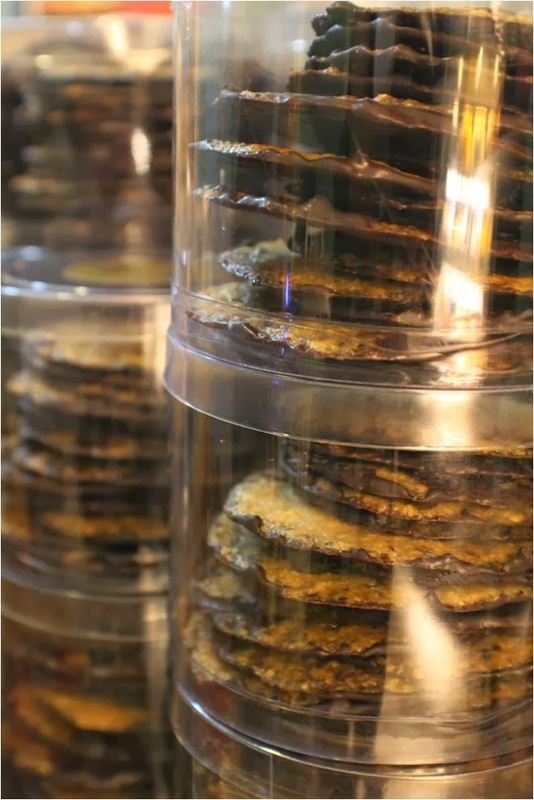 Florentines are thin, crisp yet chewy biscuits laced with Belgian chocolates. The base for Florentine biscuits is essentially a roux, an oh-so-French cooking technique, which signal the origins of this delicate tea-time cookie. The streets of Tomas Morato was still busy at almost 10 pm when I decided to pay it a visit. Seats outside are taken already, seeing that there is only one table inside with just two seating, I got this daunting feeling to just buy some cake slices and bring at home, and some of those Florentines as well. I never really expected to get a good cup of coffee here but I tempted my fate seeing that there is a stairway leading to the second floor area and as what the lady staff said about the the floor being empty. On one corner where the stairs are located is a meager table with their to go products were showed off. Eureka! The packaged Florentines were there. I also got a box of assorted oval-shaped bars. At the second floor, as I waited for my coffee and choice pastry, I get to snap some shots from it. It was simple, no fuss and taitless - a tad boring for me though. There is one framed painting of a lily seated a top a block of chocolate, however. Most of the time my curiosity for certain dining establishments goes beyond it's menu. I love reading or listening to stories of how it was built up, why the choice of name or how the owner's character was depicted in their craft. The Fleur de Lis mimeos a lily or lotus flower. It is often used to represent French Royalty, and is believe to symbolize life, light, and perfection. However, I find it hard to get connections from the name to the whole theme of the pastry shop. Anyways, let see about the food. Since I opted for a light slice of cake, I got another sweety treat for my cup of coffee. Macadamia nut latte. 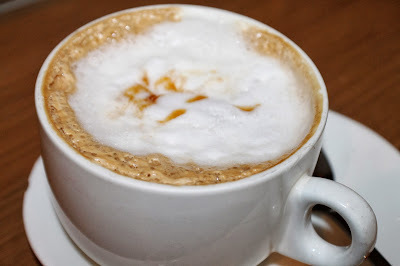 I love how this coffee rendered a nutty aroma and flavor with a hint of mocha and a gourmet coffee can not be exciting enough without the milky froth, and it actually came in layers of two kinds, milk and chocolate. 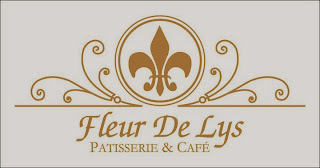 I was kinda expecting a coffee art with the Fleur de Lys symbol on top. Sorry, it's me being finicky on my food. Now, for my sweet night cap - Fleur De Lys' Best Kept C-cret. Nothing is so secret about this cake though. I chose between another best-seller, The Next Best Thing and this. I have my top choices for chocolate cakes and the latter seemed like what we had at Dillinger's, a molten (also known as lava cake) chocolate cake served with vanilla ice cream. 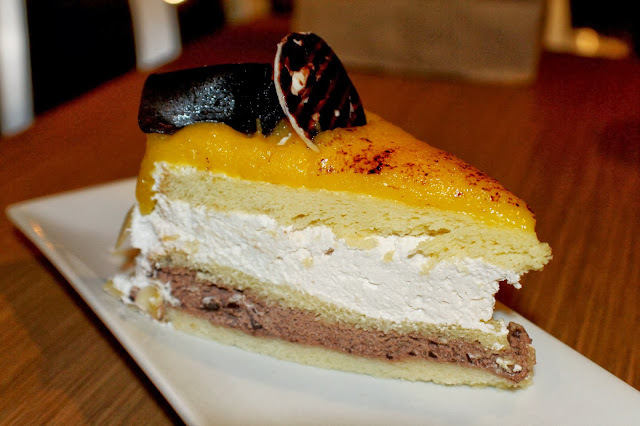 What makes this worth-trying is having a layer of beautifully stacked up cakes and creams in one fork-bite. Let me deconstruct the layers for you. From top to bottom: vanilla chiffon cake, chocolate mousse, vanilla chiffon cake, yema cream, chiffon cake and custard. For the non-chocolate-lovers, if there is one, this can probably caught their attention and might gain their liking. I found this to be particularly best partnered with green tea or black tea. I'm not the cream-lover either, so I can't count myself to rave about this. If you ask if I will still come back to try their other pastry, I say yes! I want to try their Picasso Pavlova and Pocket Garden (or simply carrot cake). wow!!! nice: looks masarap ah!!! para baka sakaling makahanap kau ng ibang restos!!!! thanks!!! i followed you po and listed you in my blogroll!! !